Yoga has many benefits - increased flexibility and strength, yes, but it also helps with stress reduction, PTSD, depression, anxiety, digestive issues, cardiac issues, addiction recovery, increased self-esteem, weight loss and much more. Yoga is appropriate for you where ever and when ever you are in your life. As unique as you are, so is every yoga teacher. Finding the right fit for you might take some time and exploration, but what a great journey to take. You might also find that there is more than one teacher for you. Enjoy the process and remember, this is for you. Be kind to yourself. I currently am teaching several public classes during the week. If you would like any information about any of the classes listed here, click on the studio name to go to their website. Here you will find class descriptions, pricing and directions. * Yoga for Vets These classes are NO COST and are specially designed class for active and retired military personnel and their families. For more information please click on the "Military" tab at the top of this page. Chatsworth Vet Center - See “Military” tab for more information. Yoga 1-on-1 - There is tremendous benefit to working one-on-one with yoga. Individual attention provides an opportunity for a truly customized practice. Private Sessions are available by appointment. Sessions can be scheduled at my studio or at your location. Mats and props are available if needed. Private Groups / Corporate classes - Privately scheduled group classes are great because they work on your schedule with the people you want to practice with. Groups can be scheduled at my studio or at your location (home or business). Mats and props are available if needed. Any of the above private options can be scheudled by appointment. Contact me for pricing and availability. In other words, Yoga Therapy incorporates a centuries old philosophy and physical awareness to tap in to the body's remarkable ability to heal itself. For me, it is the process that has made the most sense for my body and my mind. For my students it has not just been a means of relief, but a window of "hope" and excitement that a new future is possible. Who can benefit from Yoga Therapy? Anyone and everyone. I have seen remarkable changes in people suffering from any number of conditions; anxiety, depression, addiction recovery, respiratory issues, chronic pain issues, arthritis, diabetes, sports injuries and many more. 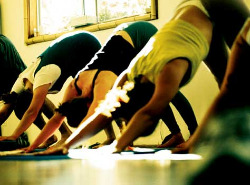 Yoga Therapy sessions run 1 hour and are designed towards the specific needs of the client. Please contact me with any questions and appointment availability.